Graham Sacker’s piece on the 40th battalion MGC in Emma Gee,the MGC Old Comrade’s Association magazine ,encouraged me to write about my great uncle Wilfred Livermore MM who served in the MGC from October 1915 until March 1918 when he went missing whilst with D company 40th Battalion MGC around Ervillers south of Arras. Wilfred was a member of my maternal family that came from rural Essex near to Chelmsford and was part of that huge army of agricultural workers prior to the First World War. My great grandmother was born Lucy Livermore and her brother William had a son called Wilfred William Livermore born on December 18th 1897 in the village of Felsted in Essex. I know little of his early life except that after school he joined his father as an agricultural worker. There was an extended family of Livermores and their cousins the Jarvis family my great grandmother’s married name. As was the case in those times these were large families with Wilfred having five brothers and sisters according to the 1901 census. The children of the Livermore and Jarvis families must have all gone to school and played together in that period before August 1914. Thus there was Wilfred born 1897, his cousins Albert Livermore born 1886 and Leonard Livermore born 1886, Ernest Jarvis born 1890, Albert Jarvis born 1892 and Frank Jarvis born 1897. All were to serve during the war though sadly four of them were to sacrifice their lives. The war broke out and the call to arms resulted in thousands of young men enlisting for fear of missing the excitement as it was predicted to end by Christmas 1914. Although it was harvest time in rural Essex, men like Wilfred Livermore and his cousin Albert Jarvis joined up in August 1914 both going into the 9th Essex which went out to France on May 30thth 1915 as part of the 12th Eastern Division, one of the first of Kitchener’s new army divisions. 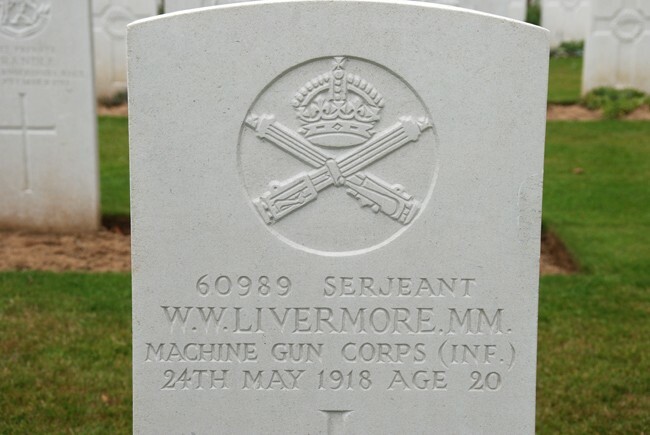 Private Wilfred Livermore 12200 was only 17 at the time. 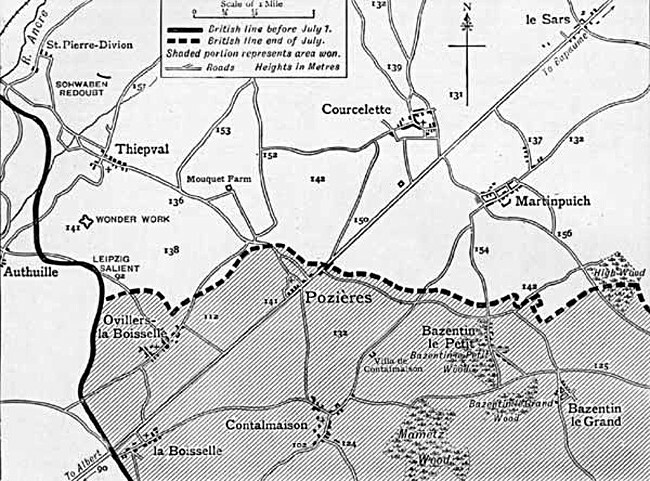 May 30 1915 The whole battalion embarked on The Queen and arrived at Boulogne at 12 midnight. 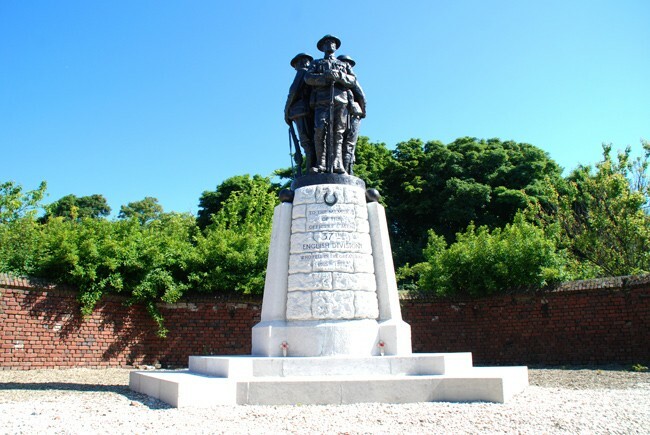 Initially Wilfred and Albert with the 35th Infantry Brigade were posted to Ploegsteert south of Ypres until in October 1915 they were transferred south to the latter stages of the Battle of Loos. 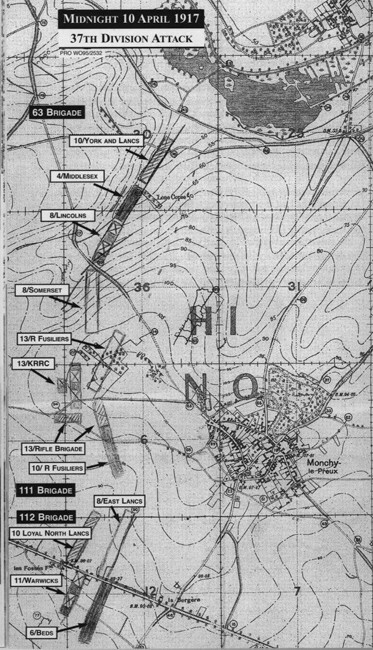 The 9thEssex took over the old German front line trenches which had been captured by the Guards Division and was involved in an action around the Hohenzollern Craters. October 18 1915. Essex bombing squads were stationed at points to prevent attack there and M Guns were placed in commanding positions. After this their paths diverged as in late October 1915 Wilfred was transferred to the newly created Machine Gun Corps. He probably spent time at the special Machine Gun training school at Wisques in Northern France before being posted to the 35th MGC company to use the newly introduced Vickers Machine Gun capable of firing 500 rounds per minute. Wilfred became part of a gun team of 6 men . The war diary of the MGC 35th company WO95/1853 shows that it was in the 35th brigade of the 12th Eastern division which also included the 9th Essex from which Wilfred had been transferred. 2.7.16 11am Brigade was ordered to attack the following morning the village of Ovillers. The trenches & ground in front of Ovillers was thoroughly reconnoitered and the guns disposed for the attack. 4 guns took up positions to support the infantry attack with direct overhead fire on Ovillers and the ground between La Boisselle & Ovillers. 3.7.16 3 am The infantry attack commenced. 5 30 am The infantry having failed to gain their objective fell back. The guns continued to fire through the day till 4 pm. Wilfred and his comrades in the 35th MGC continued to fire on the enemy whenever they appeared around the village of Ovillers until on 6th July they were relieved and went behind the lines. 6.7.16 4pm The company was relieved by 36th MGC and went into billets in Albert. 7.7.16 Guns & equipment were thoroughly cleaned and the men rested in billets ready to move at half an hours notice. All ranks were in the best of spirits and a piano having been found a concert was organised from 6pm to 8pm. In late July 1916 the 35th MGC was in trenches at Auchonvillers together with 35th Infantry brigade who were involved in the highly dangerous and much hated activity of night time raids into no man’s land. After a period in billets in Varennes north of Albert by August 1916 they were back in the front line trenches astride the Albert- Bapaume road at La Boisselle not far from where they had started on 3rd July. In October 1916 Wilfred’s association with the 12th division ended when he was transferred to the 112th company MGC which was in the 112th brigade of the 37th Division. In their war diary WO95/2538 it shows that he with the 37th division moved into Arras on 9/4/1917 ready to mount an attack on the fortified village of Monchy Le Preux on the road from Arras to Cambrai. 3pm Lt A W Carle with 2/Lt s Palmer left for Arras to reconnoiter the London Cave. Operation orders issued by Major H G Gauntlett commanding 112th MGC. 2 to occupy village of Guemappe. 10 15am No 4 section took up positions and opened fire on large parties of enemy on GREENLAND HILL firing about 2000 rounds until they dispersed. It was during this attack which lasted until 29/4/1917 that Lance Corporal Wilfred Livermore in the number 4 gun team was used as a runner carrying messages under enemy fire, an extremely dangerous occupation with a high casualty rate. He undertook the task with such commitment to duty and bravery that he was promoted to Corporal and awarded the Military Medal. L/Cpl W Livermore M G C of Felsted was promoted Corporal in the field for good work and has now been awarded the Military Medal for carrying messages under fire. Though the battle of Arras continued into the summer of 1917 the 112th MGC company took no further part after their withdrawal on 29th/ 30th April 1917. In July according to their war diary, they moved to the Ypres sector around Kemmel and became involved in a number of skirmishes. On 31 July 1917 the company was involved in covering the advance of the infantry on the opening of what became known as the Third battle of Ypres and this continued throughout August. 31.7.17 Barrage opened at 3 50 am covering advance of infantry . During day 200000 rounds were fired. The war diary shows that in keeping with the role of the MGC throughout the remainder of 1917 and into early 1918 the 112th company was used to harass the enemy lines firing up to 35000 rounds per day. In the early part of 1918 there was a reorganization of the MGC companies in France and Flanders so that the 112th company became part of the new 37th MGC battalion. However Wilfred Livermore was transferred to the newly formed 40th battalion MGC company D in February 1918. He was promoted to Sergeant at the age of only 20 probably as a result of his experience and the fact that he had managed to survive as a member of ‘The Suicide Club’ since October 1915. 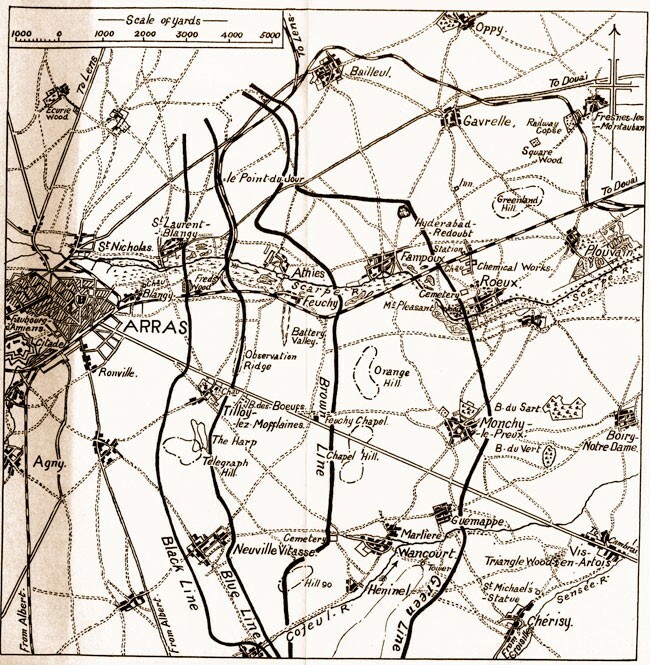 As Graham Sacker explained in his piece in Emma Gee, the 40th division was right in the path of the German offensive of March 1918 south of Arras. Company D was located near to the village of St Leger when the German attack commenced on 21 March 1918 and as the British fell back the 40th MGC battalion remained in position to cover them and inflicted huge casualties upon the massed ranks of the German storm troopers. The war diary of the 40th battalion MGC WO95/2601 provides stark details of the battle in which they were engaged between 21st and 26th March 1918 around the village of Ervillers south of Arras. March 11 1918 From information received it appears probable that the enemy will launch an attack on V! corps front on morning of 13th March. March 12th D company with 120th Brigade group at Hamlincourt.All units ordered to hold themselves whilst in close reserve to move at 3 hours notice from 8 am to 8pm and 1 ½ hours notice from 8 pm to 8 am. March 15th order to be prepared to move received 6 30 am This was a trial to find out the preparedness of units. Message received at 4 am that deserter states that enemy is going to attack opposite Monchy on the morning of 18th. March 18th Situation normal - no enemy attack. 6 30 am B and D companies reported ready to move. 11 30 pm “B’ and “ D “ companies ordered to take up positions in the 3rd system to support the 120th and 121st brigades. March 24th Enemy attack continued all along 40th Division front. Orders received for relief of 40th Division . Battalion to be relieved on 25/26 March . Issued orders to B,C, and D companies for relief. March 25th Battalion Headquarters and “A “ company moved to MONCHY AU BOIS. “B”, “C” and “D” companies joined from the line during the night. March 26th Battalion paraded to move to BIENVILLERS AU BOIS. Stopped en route and ordered to send guns for the defence of ADINFER WOOD. The guns of “D” company arrived at ST LEGER – VAUX road at 5 pm on 21 MARCH 1918 and immediately came into action------ about 600 of the enemy advanced west of Ecoust and coming into action from their limbers annihilated them. At about 10 am on 22 MARCH 1918 the enemy drove strong attacks. “D” company brought heavy fire to bear on them inflicting very heavy casualties and on one occasion annihilating about 1000 of the enemy in massed formation. 22/23 MARCH 1918 north of Mory the enemy launched a heavy attack in the afternoon and forced our infantry back. £ sections of machine guns caught him as he advanced over the ridge doing great execution and covering the withdrawal of our infantry. At 10 pm the enemy again attacked and forced our infantry to withdraw. The machine guns were again able to cover the withdrawal and inflict heavy casualties in the Germans. On 24 MARCH 1918 the enemy made continuous attacks on MORY and suffered heavy casualties from the fire of B and D batteries. On 25 MARCH about mid day the enemy attacks on ERVILLERS were resumed . No 2 section was enabled to deal with large masses of the enemy and to inflict heavy casualties on them. The section only withdrew when it was practically surrounded on the high ground west of Ervillers. On the night of 25/26 MARCH 1918 orders were issued for the guns of 40th Bn Machine Gun Corps to withdraw as the 42 Bn Machine Gun Corps had taken over the Machine gun defence of the line. Lt Whittaker with his 4 guns remained in position after the infantry had withdrawn and held off the enemy firing at 800 yards range into dense masses. He is now buried in the CWGC cemetery outside the village of Favreuil a few miles north of Bapaume and some miles south of the action in which he went missing. The date on his headstone is 24th May 1918. (Figure 8) The cemetery was commenced by the British in March 1917 but in March 1918 it fell into German hands and was retaken in August 1918. There are no precise details in the War diary about him so I can only imagine that he was involved in the defence of Adinfer Wood remainIng behind to provide covering fire to the withdrawing troops of 40th Division . 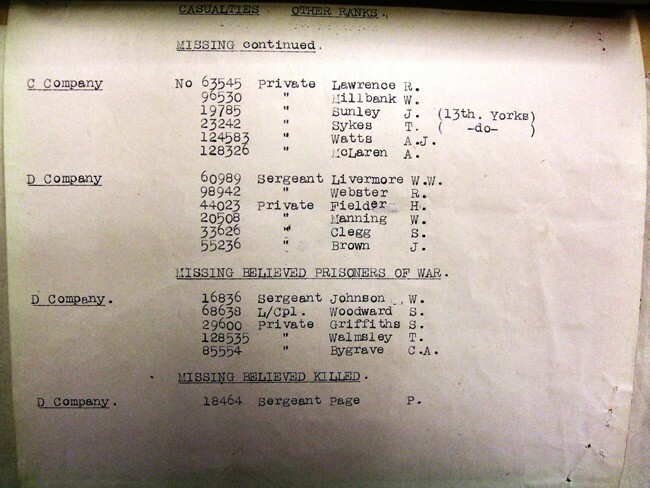 The 40th Bn MGC War Diary lists him as missing but not as a possible prisoner of war. Yet he is buried in Favreuil British Cemetery some distance south east of the action on 26th March having died on 24th May 1918 two months after the action. This suggests that he was taken prisoner and died in captivity. Assuming this to be the case, the only way to confirm it is to get evidence from the International Red Cross – ICRC - in Geneva who hold index cards on all the prisoners of war from WW1. 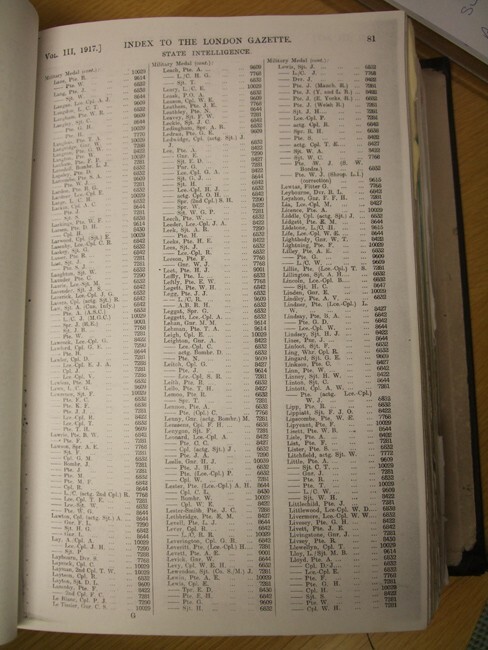 The ICRC in Geneva is currently engaged in putting all of their WW1 prisoner of war records on line - an enormous project which is due to be completed in 2014. I contacted them and was very lucky to get a response given that they are no longer responding to individual WW1 enquiries. 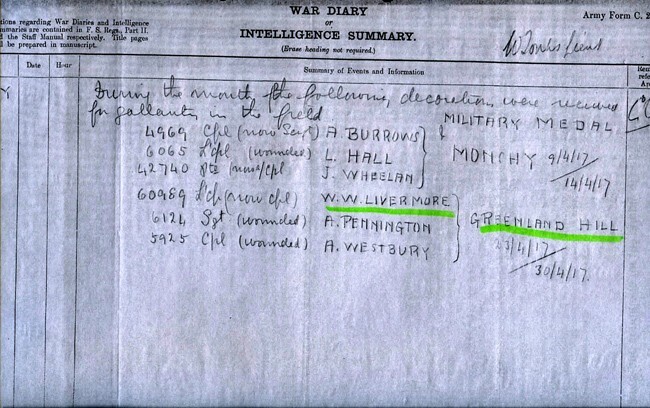 The ICRC attestation document (Figure 9) shows that Sergeant Wilfred W Livermore was captured at Gommecourt N .W .of Albert and a short distance from Adinfer Wood. He was detained in a German army field hospital in the village of Beugny north of Bapaume. 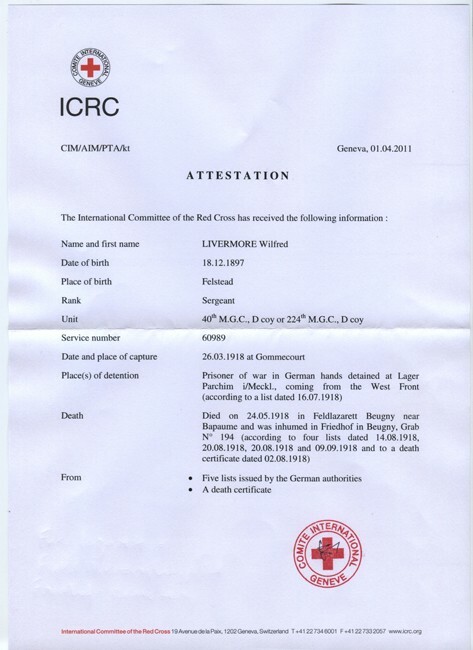 The ICRC attestation document also says that he was buried in plot 194 of the German cemetery in Beugny and his death certificate is dated 2/8/1918. So that at some point after the armistice his body was transferred to Favreuil British cemetery along with the 7 other British soldiers buried in the Beugny German no 3 Cemetery. Throughout the operations all ranks fought with greatest gallantry and tenacity and with absolute disregard of danger . The enemy attacked in close formations which gave our machine guns ideal targets. It is difficult to estimate the casualties caused him by our machine gun fire but they must have been enormous. Regrettably, I have no original documents on Wilfred William Livermore M.M. I have no photographs, no diaries, no letters and no contact with Livermore family although a visit to Felsted churchyard shows that they are still a local family. The only thing I do know is that his 1915 star was sold on Ebay in February 2006. Unfortunately I was not able to bid for it! 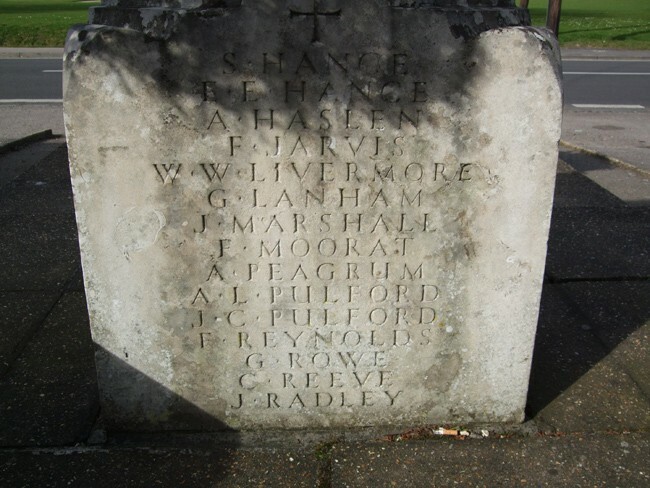 Wilfred’s name remains on the war memorial in Felsted (Figure 10) with his cousin Frank Jarvis above him. He is also remembered on the Rolls of Honour in Felsted ‘s two churches and on the MGC Roll of Honour in St Wulframs’s Church, Grantham. I am indebted to Graham Sacker MGC Old Comrades Association for his assistance in helping to trace Wilfred’s story and in bringing to light the bravery of a distant relative who with thousands like him joined up in the patriotic fervour of 1914 only to die a few months before the end of the war.